In Sweden, the Crayfish Party or ‘kräftskiva’ is a loved and celebrated food tradition. We look forward to sharing our Swedish heritage with our customers in a fun and festive way. 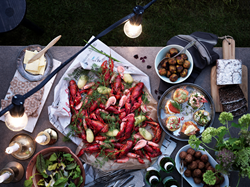 As summer comes to an end, IKEA will host its annual Swedish Crayfish Party – an all-you-can-eat crayfish buffet – on Friday, September 16 at participating stores nationwide**. The Crayfish Party is a Swedish tradition that dates back to the 1800’s, when crayfish fishing was limited to August and September. To celebrate the beginning of crayfish fishing season, families and friends would host late summer parties – gathering in paper hats and colorful crayfish-themed bibs – to enjoy good food and good company amongst the sound of music and clinking classes. This season, IKEA is inviting everyone to join in the fun! Tickets are available for $18.99 per person / $4.99 for kids 12 and under, or at a discounted rate for IKEA FAMILY* members ($14.99 per person / $2.99 for kids 12 and under), for an all-you-can-eat buffet featuring crayfish, cucumber salad and more. Seating is limited, so those who are interested are encouraged to purchase tickets early at their local IKEA store. To locate and contact the nearest IKEA store for more details, including local seating times, visit the “Store Locator” page on http://www.IKEA-USA.com and enter your city/state or zip code. Those not able to make it to the event can still enjoy the festivities at home! Visit the Swedish Food Market in IKEA U.S. stores to explore, find and try ingredients for Swedish recipes such as traditional cheese pie. Mix butter and wheat flour. Add water and quickly work into a dough. Leave to cool for 30 minutes. Roll out the dough to fit the size of your pie dish (preferably 8–9" in diameter). Fold the dough about ½" in around the edge so that it does not slide down during baking. To let the steam out during baking, poke holes in the bottom of the dough using a fork. Pre-bake the dough at 350°F for 15–20 minutes. Mix egg, cheese, cream, chopped chives and dill. Add salt and pepper. Pour the filling in the pie dish and bake for another 25–30 minutes. **IKEA Carson will not be participating/will not be hosting a Crayfish Party event.